Mode: Candidates applying for ESIC 2019 Recruitment for Junior Engineer and Insurance Medical Officers (IMO) Grade-II have to apply only through online mode from the official website "esic.nic.in". Availability: Last date to apply is 15th December 2018. 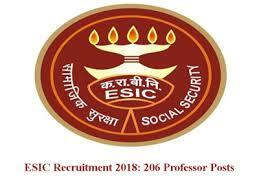 Application Fees For ESIC 2019 is INR 500/- for OC/OBC and INR 250/- for SC/ST/PWD candidates.